Set 100 years after Return of the Jedi, the Jedi Order and the Republic are restored to their old glory. 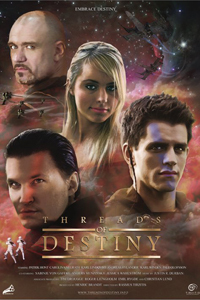 Threads of Destiny is a feature length fan film based in the Star Wars universe. Filming began in the summer of 2005, and after 9 years of production it was finally released on Youtube in February 2014, where it already gained more than 1,000,000 views within the first 9 weeks. Over 1,500 vfx shots are produced by a large group of volunteering vfx artists around the world. From 2007 right up until the end of 2013 I worked as the lead compositor & 3D artist on the project, concluding with a total of over 720 VFX shots in the final cut. The work required a very large variety of tasks such as greenscreen keying, rotoscoping, CG integration and fully digital shots. A personal highlight of the body of work was one of the main action sequences in the film, involving two ships chasing each other through an asteroid field, which was completely designed & created from scratch.